This Saturday, Feb. 9, Duke University will grapple with a portion of its racial history, commemorating the fiftieth anniversary of a pivotal occasion that forced the university to eventually evolve to offer one of the top-ranked black studies programs in the country. 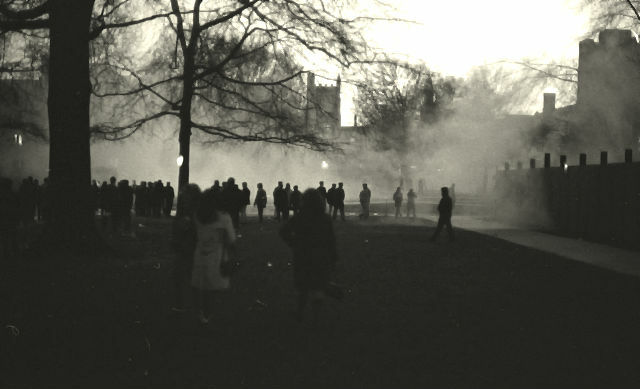 The story of the Feb. 13, 1969, “takeover” of the Allen Building, a surreal moment when tear gas covered the quad, only hastily captured in blurry black and white photos, has been passed down through generations of student activists. Now, on the anniversary of their activism, the Department of African & African American Studies at Duke for which they paved the way, has invited those black student activists back to campus to acknowledge their sacrifice and contribution to the university. The group will reunite this weekend for “Commemorating the 1969 Allen Building Takeover: Fifty Years Later,” an event hosted by the department. To see the full schedule and available parking, go to https://aaas.duke.edu/abt50. Those unable to attend can watch a YouTube live stream and follow the discussion on Twitter @dukeaaas or by searching hashtag #DukeABT50. Nearly 30 of the original Allen Building Takeover participants are expected to return to Durham, many of whom have not seen each other for 50 years. They have mixed feelings about their experience at Duke and are pleased to know about the impact of their activism. “Fifty years later, it brings me great joy to know that the same institution which called in the police and National Guard on us in 1969, would today, welcome us back and acknowledge that our actions contributed positively to the evolution of the university,” said Catherine LeBlanc ’71, a business/education consultant, who was among the fifth class of black students to enter Duke. LeBlanc will moderate a panel of fellow participants sharing first-hand accounts. A second panel will feature Duke alumni from several generations, including the recent 2016 Takeover, as well as former local/community activist Howard Fuller who mentored the Takeover participants. 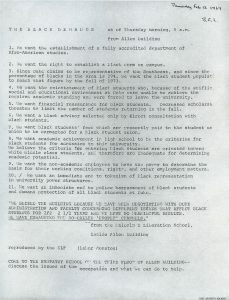 “Six years after the first cohort of Black Students entered Duke in 1963, Blacks students and their allies were willing to put their academic careers and professional futures on the line, to push the university into the future,” said Mark Anthony Neal, professor and chair of the Department of African and African American Studies. “The sacrifice of those students, including the trauma and anger they may have carried with them from participating in The Takeover, has helped create the Duke that we know today – not quite where it needs to be, but a far cry from what it was,” he said. For more information on the Allen Building Takeover, visit Guide to the Allen Building Takeover Collection, 1969-2002 or listen to recordings of student radio station broadcasts from February 13, 1969. The Allen Building Takeover marks the moment that Duke as an institution began to grapple with what it means to be an inclusive community, said Duke University Archivist Valerie Gillispie. “The alumni who participated in the Takeover did so at significant personal risk in order to bring attention to the struggles of African American students,” she said. Last summer Gillispie organized a team of undergraduate students to curate an exhibit, “Black Students Matter: Taking Over Allen in ’69,” set to open on Feb. 13 in Perkins Library, Chappell Family Gallery. The event, free and open to the public, will begin at 4:30 p.m. Duke undergraduates, Lexi Kadis, Alan Ko, and Zara Porter, under the mentorship of a Duke graduate student, Ellen Song drew from a number of collections held by the University Archives to curate the exhibit. “It is important to take time to reflect on how far we have come and what is left to do to help make the campus community one where all feel welcome and supported. It is because students demand change that institutions are made better,” Guinn said. For more information, contact the Mary Lou Williams Center for Black Culture.